Two days before leaving for Peru to begin researching this book, we attended a family gathering and could not resist regaling our relatives with enthusiastic plans for the project. To our surprise, a worldly and well-traveled cousin, Daniel, asked, somewhat naively, “What exactly is trekking?” We did not have the opportunity to offer him a thoughtful reply at the time, but the subsequent three years and 1500 km on the trail gave us ample opportunity to ponder the question. If you are reading this book, then chances are that you already have your own ideas about trekking. We briefly offer ours to give a better sense of who we are and what you might expect from us in the following pages. To us, trekking is more than just a form of tourism, sport, or leisure; it is our passion. Independence appeals to us. We like carrying everything we need on our own backs, relying on our own abilities to safely enjoy a long journey, and immersing ourselves in solitude and the rhythm of life on the trail. We are curious, always seeking out new routes, new experiences, and new forms of cross-cultural interaction. We love all aspects of nature. For some people, spirituality is a quest for supernatural experiences; for us it is inspired by the boundless wonders of the natural world. We enjoy challenges: climbing a higher pass, photographing a tiny flower or an elusive bird, making a better map, and the challenge of adapting to the unexpected. Above all, we are grateful for the privilege of exploring and trekking together. We warmly invite you to share our passion and our interests in a land that is ideally suited to them. Peru has everything for the trekker. No other country in South America combines the variety of world-class natural, archaeological, and living cultural attractions that Peru does, making them all part of an exceptionally rich and diverse trekking experience. The nation’s heritage includes an ancestral tradition of long-distance foot travel. Horses were introduced only in the 16th century by the conquering Spaniards. Centuries earlier the Inca Empire had consolidated, improved, and extended tens of thousands of kilometers of runa ñan (people’s roads) built by previous civilizations, to create one of the greatest road networks of the world. Peru boasts 190 protected natural areas, covering 17 percent of the country’s surface area and home to 84 of the 117 life-zones on Earth. They include glaciated mountain ranges dropping through cloud forests and fertile green valleys to the Amazon jungle. These national parks and reserves offer outstanding trekking venues. Other superb routes simply run from village to village, or one archaeological site to another; sheer remoteness being their best protection. Peru receives around three million visitors a year, but many have only heard about the country’s most famous attraction: Machu Picchu. For all its fame and glory, this “lost city of the Incas” and the fragment of Inca road leading to it are just tips of the proverbial iceberg. For those seeking a more authentic and affordable trekking experience, Peru offers a grand array of outstanding alternatives spread over vast and seldom-visited territory. Tourism infrastructure is good, and getting to and around Peru can be quite easy and comfortable. Agencies offer all-inclusive treks in the more popular areas, such as Cuzco and the Cordillera Blanca, where there are also ample opportunities for independent trekkers to rent gear, obtain supplies, and hire guides, porters, or muleteers. Farther afield, trekkers must be self-sufficient, but the extra effort is richly rewarded by a genuinely independent trek through uncharted territory. Peru’s climate is reasonably predictable, with a well-defined trekking season from May through September. Acclimatization to altitude is an important consideration in highland areas, but elevations are nonetheless substantially lower than in the Himalaya, and there are also lower-elevation valley routes. Peruvians have trekked since time immemorial to reach their crops, tend their flocks, trade with neighboring regions, and create empires. Foreign trekkers in Peru are also not an invention of the 21st century. For over five hundred years the country has attracted rogues, adventurers, and explorers who traveled its many roads and trails in search of elusive goals. The following is but a small and eclectic sample; references to their works and exploits are given in Appendix A. From 1549 to 1550, conquistador and chronicler Pedro Cieza de León traveled extensively in early Peru to gather material for his book El Señorío de los Incas. Unlike others of his generation, he “trekked” to observe and record, rather than merely plunder. From 1570 to 1575, Francisco de Toledo, the fifth Viceroy of Peru, had himself carried in a litter along Inca roads throughout the territory he had been sent to rule. That’s hardly trekking, but it is an early attempt to come to grips with the immensity of Peru (which at the time included large parts of Bolivia and Argentina) rather than simply taking up residence in Pizarro’s Palace in Lima. Toledo later became infamous for ordering the execution of the last Inca, Tupac Amaru (see Toledo’s biography by Arthur F. Zimmerman). In 1802 German Baron Alexander von Humboldt traveled in Peru as part of a much larger Latin American scientific expedition, described in Cosmos—an enormous treatise written over the rest of his life. Among his many achievements was the discovery of the cold ocean current that bears his name. It bathes the coast of Peru and regulates much of the country’s climate. Sir Clements Markham, the British explorer and later president of the Royal Geographical Society, traveled to Peru in 1852 in a successful search for the bark of the chinchona tree, from which quinine was extracted to treat malaria. He tells his own story in Travels in Peru, while a comprehensive historical review is found in Mark Honigsbaum’s The Fever Trail. Antonio Raimondi was an Italian professor and true renaissance man who traveled and explored throughout Peru during three decades starting in 1850. His discoveries span the disciplines of geography, archaeology, geology, and botany and are detailed in El Perú. Among the most emblematic is the Puya raimondii plant (see Queen of the Andes, Chapter 2). George Squier arrived in Peru in 1863 as representative of the United States government. Following the completion of his duties he traveled throughout the country investigating and sketching archaeological sites. 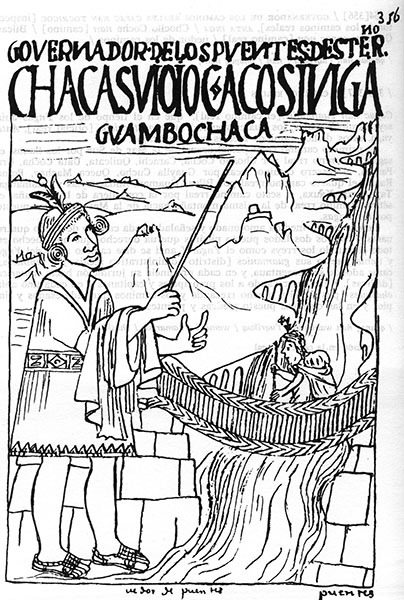 His published work, Peru Illustrated, provides a valuable record of many ancient structures, like the rope suspension bridge over the Río Apurímac, which have since been lost. August Weberbauer, a German naturalist, explored Peru in the early 20th century in search of new plant species. Numerous publications between 1905 and 1942, including Flora of Peru, record his findings. A genus of cactus and various plant species bear his name. Yale University history professor Hiram Bingham III traveled to Peru in 1911 and found Machu Picchu, Vitcos, and Vilcabamba. He returned in 1912, 1914, and 1915, with the support of Yale and the National Geographic Society. His discovery of Machu Picchu has been disputed, but his work unquestionably brought the site to the forefront of world attention, as told in Lost City of the Incas and two extensive National Geographic articles. 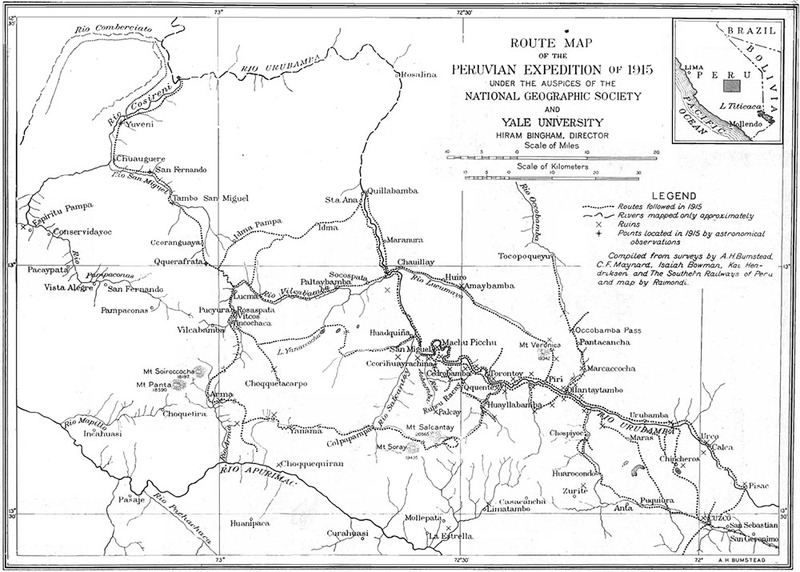 During 1953–54, Victor von Hagen, under the auspices of the American Geographical Society, traveled throughout Peru to explore, describe, photograph, and film the Inca road system, as described in his book Highway of the Sun. During the 1960s and 1980s, Gene Savoy made several journeys of exploration from the United States to Peru. He was a controversial, larger-than-life figure but is unequivocally credited with identifying the location of the last stronghold of the Incas at Vilcabamba (as told in his book Antisuyo), as well as later discoveries in the Chachapoyas area. Canadian archaeologist and writer Ronald Wright traveled the Peruvian highlands in the late 1970s. In an entertaining and informative book (Cut Stones and Crossroads), he shares his knowledge of ancient Peru and contemporary Peru of the time. Although somewhat dated, his work is very insightful. In the early 1980s, American archaeologist John Hyslop undertook a detailed scientific study of Inca roads in Peru and Ecuador. His book The Inka Road System remains a landmark work in the field. Starting in 1982, American architect Vincent Lee led various expeditions to Vilcabamba. He has published a comprehensive history of the site, entitled Forgotten Vilcabamba, including a detailed set of technical drawings. British-born writer, photographer, and independent scholar Peter Frost traveled throughout Peru in the 1970s, circumambulating Lake Titicaca. A National Geographic expeditions grantee in 2001, he specializes in investigation of the Incas. His latest guidebook is Exploring Cuzco. Limeño Ricardo Espinosa (known as “El Caminante”) walked the entire desert coast of Peru in 1995–96 to write El Perú a Toda Costa. In 1999 he trekked 2000 km of diverse Andean terrain, mostly along the Capac Ñan (Great Inca Road), from Quito, Ecuador, across Peru, to La Paz, Bolivia. His experiences, maps, and photographs are published in a bilingual book faithful to the grandeur of the road it describes (La Gran Ruta Inca). His subsequent work includes a compendium of the country’s national parks and reserves (Areas Naturales Protegidas). Felipe Varela (“El Chaski”) is a tireless Peruvian promoter of the living cultural importance of the Inca road system. Having walked thousands of miles since 2000, he is known along the length and breadth of the runa ñan he fiercely defends. See Appendix A for his blog’s address. As a trekker you will be following in these large footsteps. Please do so humbly and responsibly (see Chapter 3), being sensitive to the fragility of the natural and cultural environments. And expect the unexpected—for, to this day, trekking in Peru is all about exploration. [A]nd they built a road, the most haughty seen in the world, the longest, because it left Cuzco and arrived in Quito and it joined the one going to Chile. Its greatness is unmatched in all human history, carved along deep valleys and high sierras, over snow-capped mountains and quagmires, alongside raging torrents, hewn out of the living rock. Through these places it went, level and cobbled, with foundations along the slopes, well cut into the mountains, carved into the cliffs, with retaining walls along the rivers, with steps and landings in the snow; everywhere clean and swept. Along the way it was full of lodges, storehouses laden with treasure, temples of the sun, posthouses. Oh! What grandeur can we ascribe to Alexander the Great, or any of the mighty kings that ruled the world, that they should build such a road? Neither the great Roman road that passed through Spain, nor others we read about, can compare to this road. In the Old World all roads once led to Rome. In the Andes of South America they led to Cuzco. Considered by the Incas to be the navel of the universe, Cuzco was capital of the empire they called Tawantinsuyo, meaning “union of the cardinal points.” Cuzco was connected to the far-flung reaches of this vast empire by an extraordinary 30,000-kilometer road network, designated a UNESCO World Heritage Site in 2014. Two parallel trunks of the Capac Ñan (Qhapaq Ñan) or Great Road ran north–south from Colombia all the way to central Chile and Argentina, one along the spine of the Andes, the other on the Pacific coast. These were linked by east–west roads joining the coast and the mountains like rungs of a ladder, with extensions farther east toward the Amazon basin. Suyo means direction, district, province, or region, and the roads went north to Chinchaysuyo, today northern Peru, Ecuador, and Colombia; south to Collasuyo, now Bolivia, Argentina, and Chile; east to Antisuyo, eastern Peru, and parts of Bolivia; and west to Contisuyo, by Arequipa and the Peruvian coast. Off the Collasuyo road, a branch went southeast to Omasuyo, around Lake Titicaca. The impressive extent of the road network was rivaled only by the quality and audacity of its construction. Climbing to 5000 m above sea level, roads usually ranged from 3 to 10 m in width, but reached an amazing 30 m in some places. Many had smooth cobbled surfaces, while steeper portions climbed to passes and summits on immense stone stairways. On many sheer slopes the roads were supported by retaining walls. In wet areas they were drained by culverts and carried over swamps on raised causeways. In populated areas, roads were lined by adobe walls to prevent travelers, and the llamas used as pack animals, from invading neighboring homes and fields. Many swift rivers rush down the slopes of the Andes, and the Capac Ñan used various ingenious strategies to cross them. These ranged from simple low wood and stone bridges to spectacular suspension bridges built of rope cables supported by massive stone columns. In a few places travelers crossed rivers on ferries or in oroyas, baskets hung from ropes, a sort of ancient cable car. The Río Desaguadero, outflow of Lake Titicaca, was spanned by a unique pontoon bridge supported by totora reed boats. The grandeur of the Capac Ñan often exceeded the transportation needs of the areas it served. It was as much a monumental work, like the pyramids of Egypt, as a purely utilitarian one. The Great Road was the umbilical cord that emanated from Cuzco, navel of the universe, carrying wealth to the capital of Tawantinsuyo as well as imprinting its sovereignty on the landscape of distant dominions. Not just anyone was allowed to travel the Capac Ñan; it was reserved for those on official state business. Privileged travelers included the Inca emperor and his court, generals with their troops, government bureaucrats, llama caravans bearing goods to Cuzco, and, in one of the Inca’s major sociopolitical innovations, the mitmaq or mitmacuna. These were entire communities subjugated by the Inca Empire and sent as a group to live thousands of miles from their original homes. This effectively quelled rebellion among newly conquered peoples and distributed a diversity of skills and crafts throughout the empire. Even today, the influence of the Cañari people of the southern highlands of Ecuador, who were taken south as mitmaq by the Incas, can be felt in Cajamarca, Peru, and even distant Bolivia. The swiftest feet to tread the stones of the Capac Ñan were those of the chaskis, messengers who ran a tag-team relay race that enabled them to move verbal messages (the Incas had no written language) and kipus, knotted strings used to record accounting, 250 km a day. This meant news could travel from Cuzco to Quito (today Ecuador, then the northern capital of Tawantinsuyo) in about a week, and seafood could be brought from the ocean to the royal table in Cuzco in less than two days. The Great Road was lined by various facilities for travelers. There were thousands of tambos, post-houses of various sizes, one about every 25 km, which corresponds to roughly a day’s travel. The larger tambos had travelers’ accommodations called kallankas, corrals for llamas, and storehouses for merchandise. The road was also lined by fortresses or guard posts called pucarás, and by apachetas, large mounds of stones used to mark intersections and mountain passes as well as for ceremonial and religious purposes. Maintenance of the road and its associated infrastructure was the responsibility of local communities, as a form of mit’a, tax or tribute to the Inca rulers. Following the Spanish conquest, many parts of the road fell into disrepair because of the collapse of this system and also because of the introduction of horses. The Incas had not invented the wheel, largely unnecessary in their geographic environment, nor did they have horses or donkeys. The Capac Ñan was designed for human feet and the delicate hooves of llamas and alpacas. The segments of ancient road that best survived the colonial period were those that were too steep for travel by horse and were therefore not damaged by iron-shod hooves. Sadly, some of the surviving roads later fell victim to contemporary road construction. The Inca roads were so well built that, over five hundred years after they had been abandoned, engineers continued to use them as foundations for paved streets and roads. Today this practice is, in principle, prohibited, but modern roads are often built sufficiently near the Capac Ñan that the latter is buried by construction debris. Fortunately many sections still survive intact, some over 100 km long. The best ones are in Peru, and they are among the country’s most spectacular trekking routes. Except for the small fragment of Inca road that today carries five hundred visitors a day to Machu Picchu, they are seldom visited by outsiders. Perhaps responsible trekking can play its part in protecting the road by raising awareness of its importance and by bringing sustainable economic benefits to the remote communities through which it passes. The authors trekked 400 km along the Capac Ñan in 2007, and that extraordinary experience has been one of the inspirations for this book. 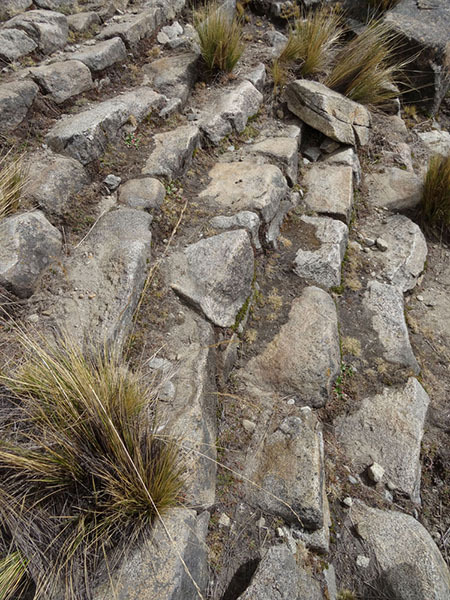 Segments of Inca and pre-Inca roads are included in Treks 2, 7, 12, 13, 17, 18, 22, 23, 27, 28, and 30. They are likely included in others as well, albeit without our knowledge. Who really understands the origins of all the winding paths along which we travel?